Do Natural Processes Mitigate Contamination from Landfill Leachate? USGS scientists conducting chemical analyses on site and in an on-site mobile laboratory in order to identify important degradation products from the natural attenuation of landfill leachate in the aquifer. In order to predict how long landfill leachate will continue to contaminate groundwater after a landfill is closed, it is critical to understand how effective natural processes are in removing those contaminants over time. U.S. Geological Survey (USGS) scientists and their colleagues‡ have developed a multifaceted approach for studying the natural attenuation of landfill leachate in the subsurface. The sustained removal of contaminants by monitored natural attenuation currently is a remediation alternative in use at many contaminated sites across the Nation. Assessing the sustainability of natural attenuation involves more than mapping the distribution of contaminants in the subsurface; it involves determining how long these processes can be maintained given local geochemical conditions. The scientists’ approach can help determine the sustainability of monitored natural attenuation as a remediation option at landfill sites across the Nation. In the United States alone, approximately 135 million tons of municipal solid waste (MSW) was deposited in landfills in 2008, making landfills the most common method of MSW disposal. Of particular concern are the closed landfills in the United States, estimated at more than 90,000 two decades ago. These closed landfills are typically unlined and do not have leachate collection systems and constitute a potentially persistent national threat to downgradient groundwater quality. Landfill leachate can contain a wide variety of inorganic chemicals, such as toxic metals, and organic compounds, such as industrial solvents, depending on what was disposed of in the landfill. Leachate that discharges from a landfill can vary greatly with time. USGS scientists and their colleagues found elevated concentrations of dissolved organic carbon, methane, ammonium, iron, chloride, aluminum, barium, chromium, cobalt, nickel and many trace organic compounds in the groundwater downgradient from the Norman Landfill (which was closed in 1985). Organic chemicals identified in the leachate included bisphenol A, pharmaceuticals, pesticides, disinfectants, and fire retardants. Understanding the supply and consumption of electron acceptors in the aquifer materials — Consumption of electron acceptors by biodegradation reactions in the aquifer reduces the aquifer’s natural attenuation capacity with time. Determining the variability of natural attenuation rates in different parts of the plume — Natural attenuation of contaminants in the main part of a leachate plume can be very different than at plume boundaries. For example, natural attenuation in the core of the Norman Landfill plume was gradual and depended largely on the combined effects of leachate chemistry and the composition of aquifer materials. Natural attenuation at plume boundaries revealed large fluctuations with time related in part to hydrologic changes, such as interactions with surface water and changing groundwater flow paths. Understanding the hydrology and geology of landfill sites — Climate, vegetation, recharge rate, and proximity to the water table can all affect and control natural attenuation rates of contaminants. For example, mixing of the leachate plume with surface water near groundwater discharge sites or with local groundwater can affect the chemistry of the plume. Hydrological, geochemical, and microbiological processes link these interactions and factors, and ultimately control the long-term sustainability of natural attenuation. 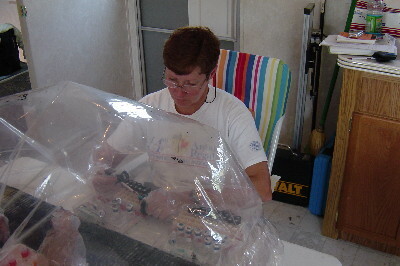 USGS scientist processing samples in an onsite mobile laboratory. The scientist is using a chamber without oxygen inside (anaerobic conditions) to isolate reactive samples from the atmosphere. for assessing the potential effectiveness and sustainability of natural attenuation as a remediation option. These results were made possible with funding from the Toxics Program and the USGS National Research Program. ‡ USGS scientists have collaborated with scientists from the University of Oklahoma, University of St. Thomas, Minnesota, Texas A&M University, and others. Cozzarelli, I.M., Böhlke, J.K., Masoner, J., Breit, G.N., Lorah, M.M., Tuttle, M.L.W., and Jaeschke, J.B., 2011, Biogeochemical evolution of a landfill leachate plume, Norman, Oklahoma: Ground Water, v. 49, no. 5, p. 663-687, doi:10.1111/j.1745-6584.2010.00792.x. Hormones Degrade in the Environment! Does NDMA Biodegrade at Ground-Water Recharge Facilities? USGS Scientists Contribute to the Landmark "Treatise on Geochemistry"
How Do You Clean Up Gasoline Spills Naturally? Can a Sewage-Contaminated Aquifer Naturally Clean Itself?